In June, 2004, Colin Angus left Vancouver on his bicycle. Nearly two years later, he rolled back in, looking like a castaway, and having completed the first human-powered circumnavigation of the globe. Angus cycled, skiied, and rowed a route that took him to Alaska, across the Bering Sea and the Siberian winter, across Europe from Moscow to Portugal, then across the Atlantic to Costa Rica–a 156-day rowing odyssey. From there it was a short 8,300 kilometre ride back to Vancouver. Along the way he burned through 4,000 chocolate bars, 72 inner tubes, 250 kgs of freeze-dried foods, 31 dorado fish (caught from the sea), 2 offshore rowboats, 4 bicycles, 80 kgs of clothing. And he showed the world that if he can travel 43,000 kilometres without polluting the planet, then the rest of us can get off our butts, and clean up our own acts. 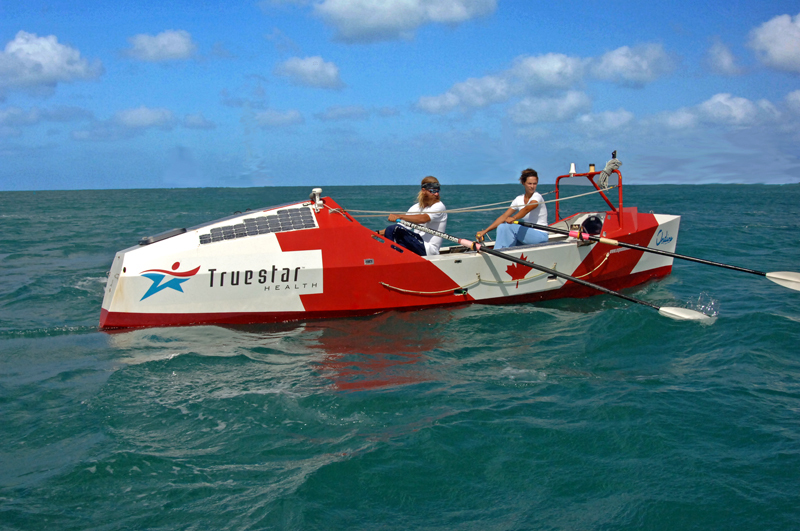 The award-winning documentary detailing the first human powered circumnavigation. Winner of the Best Adventure Film at Taos Mountain Film Festival and Jury’s Special Mention at Montreal Mountain Film Festival. Listen to the original music score Row Your Ondine Boat written and performed by Christine Leakey with lyrics by Julie’s mom Helga Wafaei. Colin Angus of Vancouver Island showed remarkable perseverance in dealing with both danger and monotony during 720 days of adventure. He paints vivid pictures of obscure places and cultures while slowly travelling through vast landscapes…. Encounters with locals bring the armchair adventurer around the world. It feels like you’re with Angus as he cycles past Russian mafia who are hanging a petrified man over an overpass by his ankles, or when he stays with friendly Siberians who spend a week’s wages to feed him, or makes nice with strangers who fix his bike for free after reading about his expedition on the Internet. The achievement is a remarkable testament to a tenacious will, extraordinary endurance and pure obstinacy…. He makes Winnipeggers feel like wimps, complaining as we do when it’s a mere -50º C with the windchill…There’s no shortage of agony and near-death experiences in Angus’s narrative. Forest fires, drowning, freezing, drunken Siberian truck drivers, Mexican banditos… are all well-documented. Imagination and originality have long been Angus trademarks..the same incidents that have always made Angus so loveable and funny continue to occur. Descriptions of wicked storms and delightful marine creatures encountered along the way brim with enthusiasm…it is livened by his fiendish sense of humour, and provides a fair view of modern adventure, with all its sponsorship struggles, internal feuds, endless planning and, thank goodness, thrills of the open road. Angus writes fluently, especially about the excruciating hardships he suffered. He gives good hurricane, too. His book is a great read. … It’s good to know that we have young compatriots of this calibre. The journey featured more than its share of hair-raising experiences. If it wasn’t enough that the trans-Atlantic portion corresponded with the most active hurricane season in history, the couple’s craft came inches from being rammed by a freighter…. While Angus doesn’t expect anyone to follow directly in his tracks, the publication of Beyond the Horizon aims to promote modes of transportation that produce no carbon emissions. Condensing this two-year expedition down into one book was a huge endeavour in itself, but Angus does an admirable job, focusing on the most interesting anecdotes and skipping through the less exciting intervals. .. In addition to adventure, drama, and romance, there is also humour to be found here.